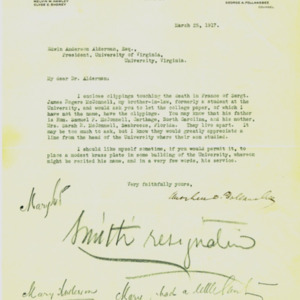 The following correspondence between President Alderman and the family and friends of James McConnell began a few days after his death and continued past the erection of the memorial at the University of Virginia. 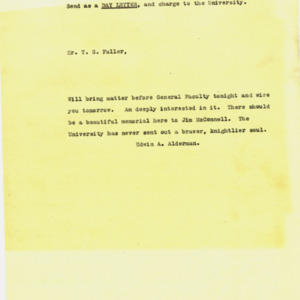 McConnell's brother-in-law, Mitchell D. Follansbee, writes to President Alderman, proposing to have some type of memorial to McConnell on the Grounds of the University. 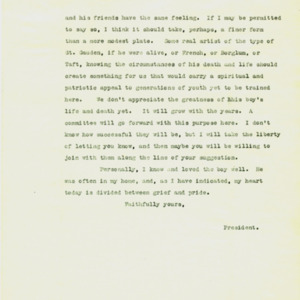 He also requests to the President to write to McConnell's parents to express condolences.
" . . . something for us that would carry a spiritual and patriotic appeal to generations of youth . 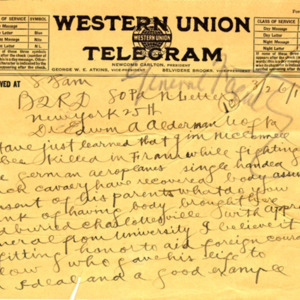 . ."
Telegram from T.S. 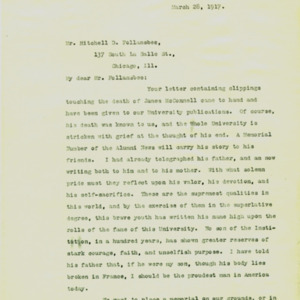 Fuller to President Alderman, who would like to bury James McConnell in Charlottesville as an example of courage and ideals. [No date] President Alderman assures T.S. Fuller that he will mention the idea of proper burial before the General Assembly. 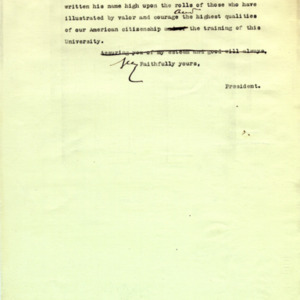 President Alderman writes to the Hon. S.P. McConnell, James' father, expressing his pride and sadness about James' heroic death. 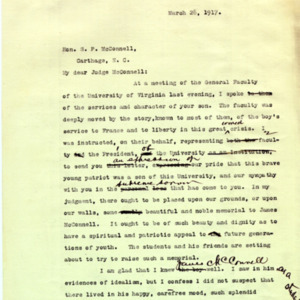 He mentions the idea of a memorial to James on the University Grounds. President Alderman writes letter to Sarah Rogers McConnell to express his condolences. 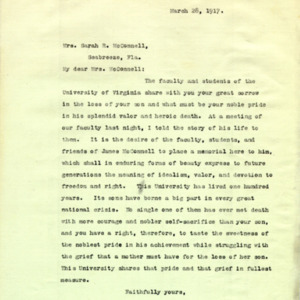 He informs her that the faculty and students are eager to erect some type of memorial in McConnell's memory.